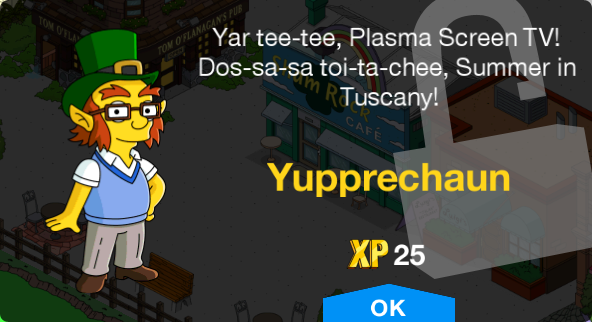 This article is about the Tapped Out's St. Patrick's Day content update from 2014. 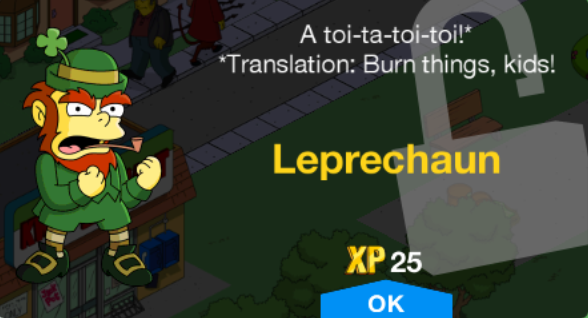 For other year's Tapped Out St. Patrick's Day content updates, see TSTO St. Patrick's Day Content Updates. ← 044 ""Diggs" and "The Man Who Grew Too Much" episode tie-in"
2013's Homer's 'Promote His Bar' and 2015's Homer's "Promote The Beer" task. 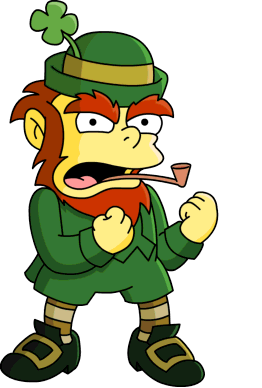 The forty-fifth content update, known as the "St. Patrick's Day 2014" content update, for The Simpsons: Tapped Out was released on March 12, 2014. 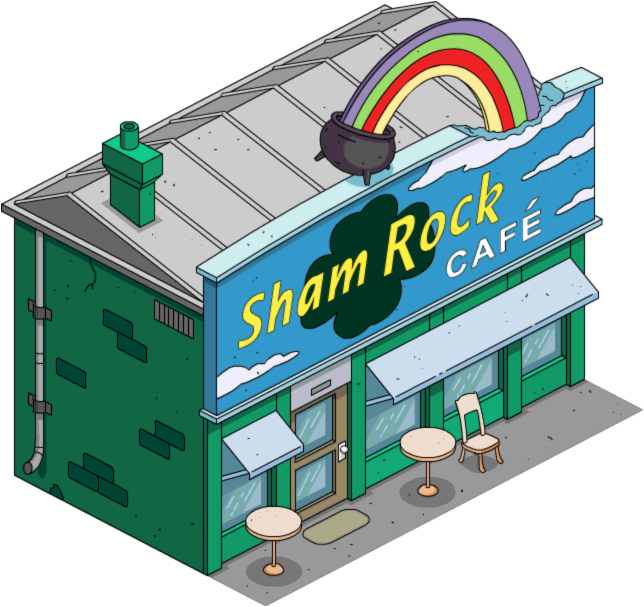 It includes a new character, Yupprechaun, a new building, Sham Rock Café, and a new decoration the Leprechuan statue. 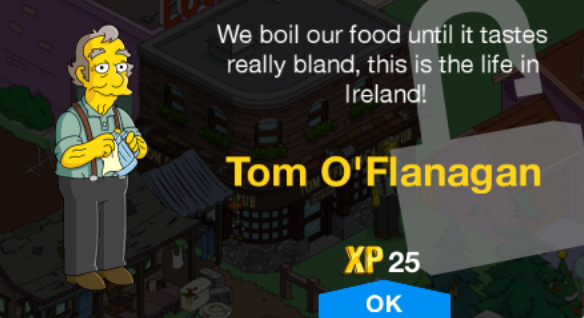 It also gives the player that missed the 2013 event a new chance to buy O'Flanagan's Pub, Wishing Well with the Leprechaun, and the shamrock topiary. Several items from the St. Patrick's Day 2013 content update were re-added in the update, for the benefit of the players whom missed the 2013's events. March is here! And you know what that means: time to make my New Years Resolution! Didn't you make a resolution in January? I did. It was stop postponing making New Years Resolutions. It isn't going well. So what's your resolution? Hit the gym? Read more? Improve your lexicon? Lisa, what have I told you about making up words. Gym? Ridiculous. My resolution is to prepare for St. Patricks's Day down at O'Flanagan's Pub so I don't end up face down in the gutter by accident. This year, I'll end up there by choice! And I won't be taking any exuses like I did last year! So leave you hangovers and heart attacks at home! The player receives "Training Day Pt. 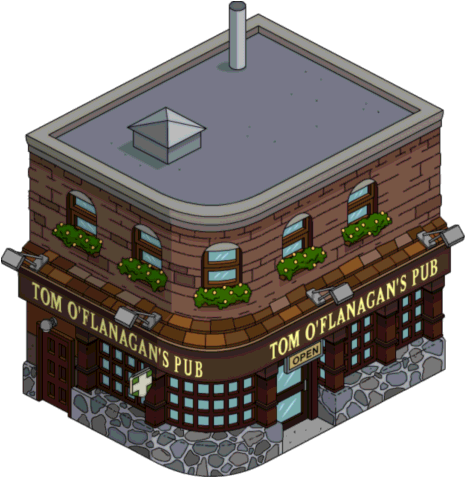 1" which is to "Build O'Flanagan's Pub" and "Send Springfielders to Train for St. Patrick's Beer Bash (x10)". It takes 12 hours and the player receives for the quest 100 and 10 in reward. To borrow a phrase from James Joyce and Spring Break Cancun – DRINK, DRINK DRINK! Second thoughts are for the sober! Drink those doubts away! Booze, you've helped me make and forget – so many bad decisions. How 'bout one more for old times' sake? The player receives "Training Day Pt. 2" which is to "Make Homer Drink his Doubts Away". It takes 12 hours and the player receives 520 and 110 in reward. Woo Hoo! It worked! I no longer regret this reckless romp of drinking! Or this Gangnam Style tattoo – guaranteed to stay topical and hilarious forever! Am I finally ready to participate in all the St. Patrick's Day festivities? No, you've graduated from a Wee Little Laddy to a Bar Wench in the O'Flanagan's School of Drinking and Tae Kwon Do. Black belt! Sorry, I mean Leprechaun Lush! but no non-Irishman has ever achieved that level. Then I shall be the first! And it will be the greatest achievement of my life! What about your three beautiful children and loving wife? The player receives "Training Day Pt. 3" which is to "Make Homer Reach Level Leprechaun Lush". It takes 24 hours and the player receives 700 and 160 in reward. Homer, you've failed at so many things: real estate exams, successfully making list of three… you must not fail at this. But this hard, glass-strewn concrete floor looks so inviting. Maybe I'll just take a little nap. The player receives "Training Day Pt. 4" which is to "Make Homer Pass Out". It takes 12 hours and the player receives 520 and 110 in reward. Hoooommmeeeer, it's me. The Ghost of Liver Past. The Ghost of Liver Past? Never heard of you. That's because those Christmas ghosts used up all of our public relations budget! It's all about social media these days. I mean… boooooooooo! I'm here to show you how things used to be when you drank responsibly, by magically transporting you through time and space. You do have to stand while I possess you though. Uhhhh… fine. But I'm bringing a brew. The player receives "Training Day Pt. 5" which is to "Make Homer See his Drinking Past". It takes 60 minutes and the player receives 170 and 27 in reward. Look upon your first St. Patrick's Day beer purchase at the Kwik-E-Mart. Who's that fat balding guy? And when do I get my raffle ticket? I really don't think you're getting what's going on here. That's you. From the past? You follow? If I say yes, will i get my raffle ticket? Where am I? The last thing I remember was a liver ghost slapping me in the face. You know what I always say, Homer — when a liver ghost slaps you, you slap back. HOMER! I'm the Ghost of Liver Future! I'm here to show you what you will become if you continue drinking. So more being possessed? Jeez, is this St. Patrick's or Halloween? The player receives "Training Day Pt. 6" which is to "Make Homer See What his Drinking Life Might Become". It takes 4 hours and the player receives 275 and 55 in reward. That was awful! The dank, dark bars. The sticky floors. The broken dreams… brand condom machines. I don't want that to be my life! Please tell me how I can change my ways! I can't… because I'm actually the Ghost of Liver Present! Bet you didn't see that coming! So this is what my life is like now? And you're what my liver looks like now? I know — sad right? There's no Ghost of Liver Future because your liver doesn't have a future. Also because people got too used to the three ghost system, so we had to change it up. Oh, you're crying. Well I'll just put down satisfied and see myself out. What have I been doing? Training for St. Patrick's day when I could have been stopping to smell the roses. Assuming people played the Valentine's Day update. I was so focused on my drinking, I forgot about the most important thing in my life — my, I don't know, family probably. The player receives "Training Day Pt. 7" which is to "Make Homer Reflect on his Life". It takes 12 hours and the player receives 520 and 110 in reward. Excuse me, Mr. O'Flanagan. I'm here to perform a task totally appropriate for an 8 year old girl — pick up my father at a bar. It's sad to think that anyone in here is actually a father… but take your pick! Hey, what are you doing to that beer? I'm about to dye it green for St. Paddy's Day. With that food-coloring! You should use a more eco-friendly dye. It would be a green way to go green… that was a joke. The player receives "Dye The Town Green Pt. 1" which is to "Make Tom O'Flanagan Dye the Beer Green". It takes 60 minutes and the player receives 170 and 27 in reward. Tom, I wanted to take a picture of all your eco-friendly green dye-usage for my blog. Perhaps this exciting development will push my readership into the single digits! Now why don't you move all this red stuff and shoe me the green. Oh My Blarney Stones! I've done it again! I must confess my deepest secret – I'm red/green color-blind. This is worse than when I accidentally joined the sinister Communist Party thinking it was the benevolent IRA! Color-blindness is not that big of a deal. It is if you're Irish! I once pinched Kermit the Frog on St. Patrick's Day. I'm a MONSTER! Luckily you're the only Irishman in this game, so you're safe. Leprechaun spies are everywhere! Whether you sprung for the premium character or not. Oh Little Lisa, would you be willing to help one more fully grown man with his problems? The player receives "Dye The Town Green Pt. 2" which is to "Make Tom O'Flanagan Actually Dye the Beer Green". It takes 45 seconds and the player receives 103 and 11 in reward. Oh. I have no way of knowing because of my color-blindness of course. This eco-friendly dye just isn't strong enough to counteract the red. I'm a sorry excuse for an Irishman. I don't even use Irish Spring. I use Lever 2000! Come St. Patrick's Day, I'm going to have an angry mob kicking down my door wanting their beer to be an unnatural shade of green, not an all-natural shade of red. And if they don't, then they'll want my blood. My emerald green blood. You mean green light/green light? … Oh no. The player receives "Dye The Town Green Pt. 3" which is to "Make Lisa Fix the Green Dye". It takes 24 hours and the player receives 700 and 160 in reward. I haven't been this sad since they canceled the short-lived Micheal Flatley sitcom – Landlord of the Dance. Maybe the Kwik-E-Mart has stronger dye that isn't too horrible for the environment? The player receives "Dye The Town Green Pt. 4" which is to "Make Lisa Shop at Kwik-E-Mart". It takes 60 minutes and the player receives 170 and 27 in reward. I'm sorry, Lisa. I'm afraid I have used all my green dye to make a Shamrock Squishee. I'm ruined! Is it too late to rebrand myself in time for Chinese New Year? If only you could take credit for our green river, but everyone knows that's just because of the toxic nuclear runoff. Toxic nuclear runoff? That sounds way more powerful than eco-friendly green dye. But all my morals! My self-righteous indignation! I couldn't! But if I lose my bar, the Irish will turn my story into a limerick for sure. And they've gotten so uncomfortable dirty. Let down a kindly old man or hurt the environment? These types of moral questions are only fun in the abstract! We can use nuclear runoff to dye the beer green, but only if you put some recycling bins around your bar. That's the spirit! Now you're talking like a useless environmental regulation committee! The player receives "Dye The Town Green Pt. 5" which is to "Reach Level 9 and Place a Dumpster (x3)", "Make Lisa Relinquish her Moral High Ground", and "Make Tom O'Flanagan Use Nuclear Waste to Dye the Beer Green". It takes 12 hours and the player receives 940 and 210 in reward. Yes, this time you're right. It's actually green. In the wise words of your father and my employer: WOO HOO! And just in time to open for out first customer: your father and my employer. The player receives "Dye The Town Green Pt. 6" which is to "Make Homer Endure Moderation" and "Make Springfielders Enjoy a St. Patrick's Beer Bash (x16)". It takes 16 hours and the player receives 100 and 10 in reward for the quest. Did a mythical creature just run across my yard? Oh miracle of creation! Brandine, get my shotgun! I've hunted raccoons, gators, possum, bargains, and briefly Nazis, but I ain't never hunted no leprechauns. Scraped one off the highway once. It had tasty hearts, stars, and clovers, but I didn't care for them horseshoes or balloons. When player log in on St. Patrick's Day. Message Happy St. Patrick's Day! Here's five donuts to Irish up your inventory. The player 5 in reward. Modified on February 8, 2019, at 10:17.